Limited numbers - they won't hang around! The Mountain Equipment Frostline Jacket is an ultralight, narrow baffled down jacket ideal for those after a warm, yet compact jacket for mountaineering, alpine climbing and trekking. The Frostline Jacket features a 700 fill power of pure down and a narrow baffle construction to allow for minimal down migration. This is protected by a DRILITE® Loft 20D shell fabric which gives impressive weather resistance. 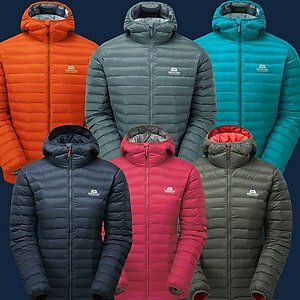 Features include an elastane bound mountain hood, 2 zipped handwarmer pockets and the ability to pack the jacket away into it’s own hand pocket. The Frostline Jacket is a minimalist down jacket that provides you with that extra insulation for fast-paced mountain activities be it walking or climbing.